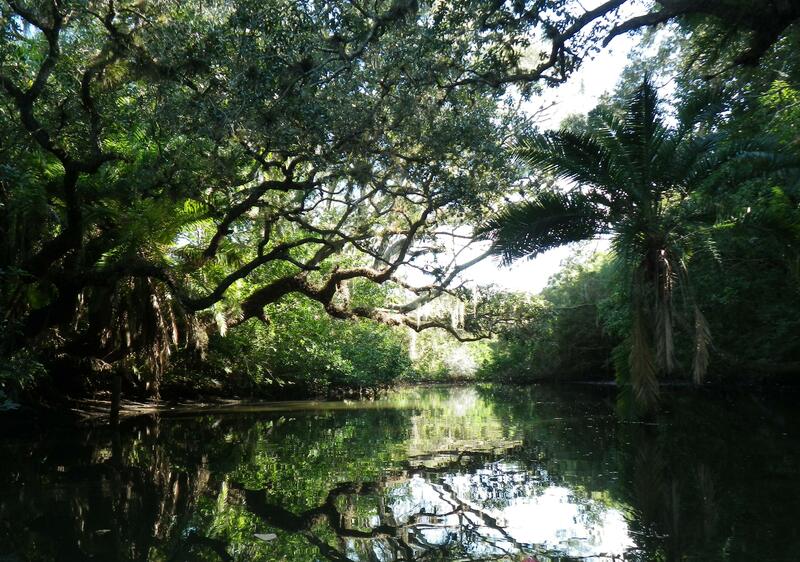 I put in at Estero River Tackle and Canoe Outfitters off of South Tamiami Trail in Estero. By the way, I have never seen such a huge selection of kayaks to rent and buy! I opted for the upgraded hard plastic model that supposedly moves faster in the water. Before heading west to the bay, I took a quick paddle up river, and was treated to a narrowed river shaded by draping oaks, cool and quiet. Heading down river, toward the bay, the river widened and the landscape changed from draping oaks to mangroves and spartina grass. The influence of the tidal changes became evident. Within the first mile, I passed the Koreshan State Historic Site on the south side. Shortly thereafter, civilization emerged, and I passed a trailer park and another small development on the north side. Along the banks, small motor boats and pontoons were lined up at docks like trinkets on a necklace. Admittedly, I was disappointed with the development along the river. At the same time, I was intrigued by much of the flora that I typically did not see, and I found myself wishing I could identify more. 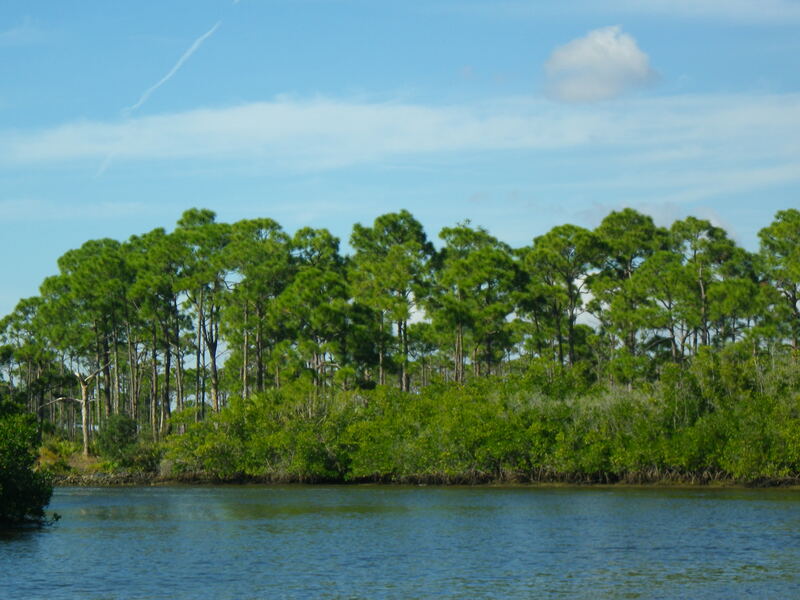 Although the mangrove swamps dominated the landscape as I neared the bay, I also saw various pines and palms, bamboo, leather ferns, sea grapes, and swamp lilies (not yet in bloom). I imagine that the traffic on the river—small motor boats, pontoons, jet skiers., and, of course, kayakers—kept the wildlife away. I saw only a few birds—little blue herons, great blue herons, and swallow-tailed kites. An osprey sat on top of his nest observing the buzz below. Signs warned boaters to slow down for manatees, but they eluded me; I saw none. It did get a little confusing close to the mouth of the river. I headed down a couple small waterways only to find that they dead ended, and I had to turn around and come back. One time, I paddled up to the bank and asked a homeowner which way to the bay! I thought afterwards that it would have been wise to time my out and back with the tide and paddle this river on a quiet weekday. This is a river where one should take his/her time and meander around the mangroves, observing the scenery and looking for wildlife. Apparently, there is a lot of history in this area and some interesting sites at the river’s mouth and into the bay. Orr and Carmichael report that there is a population of exotic squirrel monkeys along the river as well.